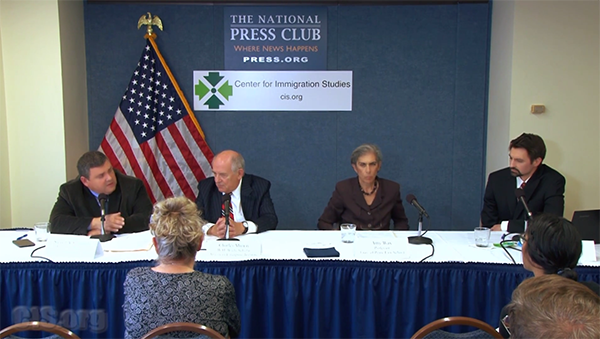 The Center for Immigration Studies hosted a panel discussion focusing on low-skill Americans dropping out of the labor force, and the role mass immigration may play in the trend. Wax is a professor at the University of Pennsylvania Law School. Her work addresses issues in social welfare law and policy as well as the relationship of the family, the workplace, and labor markets. Murray is a political scientist and the W.H. Brady Scholar at the American Enterprise Institute. He is author of, among other books, Losing Ground and Coming Apart. STEVEN A. CAMAROTA: Well, I think we’ll get started here. If anyone can’t hear me, let me know. We’ll turn up the volume or move our mouths closer to the mics. I want to thank you all for coming. I am Steven Camarota. I am director of research at the Center for Immigration Studies, and we’re the ones putting on the panel today to discuss an important paper. We have both the author of that paper and then two distinguished scholars to discuss its implications. The author will present, and then we’ll have the scholars talk about it, and then we’ll open it up for questions. Let me give quick bios for everyone here, and then we’ll get started. The paper was authored by Jason Richwine. Mr. Richwine is an independent policy analyst and contributing writer at National Review, and he will present first. His paper is “Immigrants Replace Low-Skilled U.S.-born in the Workforce.” His research has been featured in major media outlets such as The Washington Post and The Wall Street Journal, and he has appeared on TV such as CNN, Fox News, MSNBC. Dr. Richwine received his Ph.D. in public policy from Harvard University. Next will be Amy Wax, and she’ll be commenting. Dr. Wax is the Robert Mundheim – how do I say the name? MR. CAMAROTA: Mundheim; it’s Mundheim – Professor of Law at the University of Pennsylvania in Philadelphia. Her work addresses issues in social welfare law and policy, as well as the relationship of the family, the workplace, and the labor market. She earned her J.D. from Columbia University, and her M.D. from Harvard Medical School, and her B.S. from Yale University. And finally, we have Charles Murray. Dr. Murray is a libertarian political scientist and author. Dr. Murray has been a H.W. Bradley (sic; W.H. Brady) Scholar at the American Enterprise Institute since 1990. He first received national attention with his groundbreaking book “Losing Ground,” which has been credited as the intellectual foundation for the Welfare Reform Act of 1996. His many books and writings cover numerous social problems, including welfare policy and education reform. One of his more recent books was titled “Coming Apart,” which deals with social problems facing lower-income and working-class people, and is probably the most relevant to the topics we’re discussing today. He earned a Ph.D. in political science from MIT, and he has a B.A. in history from Harvard University. So, with that, I’m going to pass the microphone over to Jason. JASON RICHWINE: Thanks very much for the intro, Steve, and thanks for hosting the discussion today. Special thanks, of course, to Amy Wax and to Charles Murray for coming down here to discuss, I think, a very important topic. I’m personally excited about it because I have not heard them address immigration directly, at least not very often. So I’m looking forward to it. MR. RICHWINE: (Laughs.) I don’t know. I’m sort of on the edge of my seat here. I’m going to rush through my own presentation. No, but I’m looking forward to that. To motivate the discussion, I think it’s best actually to drive right into the first chart. And I promise there won’t be too many charts. So what you see here is the percentage of prime-age men who are not in the labor force over time. So what does all that mean? Well, not in the labor force means that you are neither working nor looking for work. That is distinct from the unemployment rate, as many of you know, which refers to people who are looking for work. So why do we focus on this set of people? Not to imply they’re the only people with problems, but they are the people with the least excuse for not working. Prime age means 25 to 54. And I chose that range as a common range because if you’re over 54, maybe you took an early retirement; and if you’re under 25, maybe you’re still in school or you took a few years off to find yourself, you joined the Peace Corps and moved to Thailand, something crazy like that. Nevertheless, that’s the range we look at. And the reason we look at men is that, for better or for worse, women still have the majority of the childcare responsibilities; men do not have that excuse. So all the analysis we talk about today will be focused on prime-age men. And you can see from the chart that that – that the percentage not in the labor force has been going steadily, gradually up. Not a lot of big peaks, no spikes, not something that the media find very interesting to talk about, but it’s been slowly going up. And if you follow social policy, this is no surprise at all. There’s lots of people who have been talking about this from sort of a scholarly level. And the other thing that should be no surprise for people who follow this is the fact that this is something that is primarily, though not exclusively, a low-skill problem. You can see this starts in 1994, now, and you see the blue line is high-school dropouts, the green line you see high-school graduates, both of them starting higher and moving up, whereas college has remained basically steady. Now, what I try to do in the paper – and it’s, you know, a pretty simple paper, just making a couple basic points I think are important for the discussion. And one of them is that there’s an immigration angle to this. You’ll notice that in the vertical axis there it says percentage of natives who are not in the labor force. And by the way, the reason we start in ’94, that’s the first time we can actually distinguish immigrants and natives. But if you look at immigrants, then – it’s the same chart and the same scale – but there is basically no difference in the labor force participation for different immigrant education levels, and of course the levels overall are also low. So, before I go on, you might say, wait a minute, Jason, you know, these educational categories, can you really compare them over time? You know, I mean, to be a high-school dropout in the 1960s means something different than it does in 2015. There was far more people back then who were dropouts, and the average skill level of dropouts in the 1960s was much closer to the average skill level of Americans. So isn’t it possible that there’s a creaming effect – this is one of the reactions I originally got – that you just have the best people moving up and leaving the least-hardworking people behind, such that it’s not really that the lower – the bottom part of the skill distribution is getting worse, but only that you’re leaving behind sort of the least-industrious people. And one way to look at that is to abandon the education categories and just look at percentile rankings. So what this is, it’s a percentile rank based on educational attainment. So if you compare, say, the bottom 10 percent in 1965 to the bottom 10 percent in 2015, you have consistently sized groups over time. There’s no creaming effect. And you can see that it tells the same basic story. The green line bottom 10 percent. The blue line is what I would call the bottom quintile – it’s the bottom 20 percent. And you can see that the lower quintiles have the greater labor force dropout, whereas the higher ones show a slight increase but not a lot. I will say the one thing that surprised me about this chart was the gray line. That’s the middle range, 40 to 60 percent. So even that is going up now. And so, as I said, this is primarily a low-skill problem, though not exclusively. So – oh, OK, if you do the same thing with immigrants here, you see the blue and orange lines are the bottom quintiles of natives. You see them going up since ’94. The yellow and gray lines are the immigrants who are in those same skill groups, and you see not much change. So what I wanted to do with the paper is kind of drill down into these worktime differences a little bit more, rather than just sort of the binary are you in the labor force, are you not in the labor force. I wanted to actually know: How many hours are people in various skill groups actually working? And you might say, well, how in the world do you do that? Because, you know, you have questions like how many hours per week do you usually work, but that’s so open-ended, it’s so vague. But nevertheless, there is a dataset called the American Time Use Survey, which I consider to be a(n) underused survey, that is a time diary. And so it actually asks respondents – it says, you know, what did you do then, and then what did you, and then what did you do, and how long were you doing it. And the Census Bureau then categorizes those responses, so you have a nice sort of systematic, consistent comparison you can make. Anyway, so I did this for immigrants and natives by education level. Now, this chart requires a little bit of explanation. It says “equivalent full-time weeks per year.” So I thought it would not be very interpretable to tell people how many total hours somebody works in a year, so all I did was I just divided that number by 40, assuming like a 40-hour regular work week, so that then you get equivalent work weeks. And if you look in the native column, you can see that there’s a very clear correlation between skill level and worktime, perhaps not too surprising – that the less than high school category, at only 34.8 equivalent weeks per year. Now, remember, high-school dropouts at this point are really the bottom of the bottom, OK, because only about 7 or 8 percent of prime-age men are in that category now. So we’re talking about a very low-skill group of people, and they appear to be idle about one-third of the year – remember, prime-age men. It gets better for high-school grads. And as you can see, it’s particularly high for people with advanced degrees at 52.8 weeks per year, which is actually more than the total number of weeks in a year. And of course, the reason for that is they work more than 40 hours per week. But if you go to the immigrant column, you again see a big difference. There’s not really a clear correlation in terms of across educational levels. You have around 50 weeks per year for the immigrants, really only getting up there for the advanced-degree immigrants. Now, this is for 2003 through 2015, because I wanted to combine the samples together because it’s not easy – the samples are kind of small for the American Time Use Survey. And you want to be careful with trends, so you don’t want to get a bunch of random noise and start ascribing some grand theory to it, which is a popular pastime for some people. But you can get some semblance of what’s going on if you group some years together to get big enough samples. And you can see here – this is natives – that even just over that 12-year period, there is a pronounced drop-off for the dropouts and for the high-school graduates. And obviously that’s due to the recession in the middle there, but there’s not been much recovery, or it’s been less than robust, so to speak. And once again, the same comparison for immigrants, and you can see that there’s been some decline during the recession, but not nearly as dramatic, and also a better recovery. And one more chart. This is another way of looking at how the replacement in the labor force is going. If you look at the far-right column, the blue column is going to tell you the native share of all dropouts in the United States; that’s 52 percent. And the orange column is the native share of hours worked by dropouts in the United States. You can see that’s only 40 percent, meaning that immigrants are working 60 percent. And that share of the hours worked has been going down faster than the share in the overall population. So, what does this all mean? Well, what I would say is that it’s fairly inarguable that immigrants are replacing natives, particularly low-skill natives, in the workforce. But notice my careful use of the term “replace” here. I did not say push out. We can’t prove that with this kind of data. I mean, it would be convenient for me to say that. It would be nice to say immigrants are the cause of all of our problems, but it’s just not necessarily true. Certainly you can come up with a plausible scenario in which immigrants are causing some of this problem, in that you could say immigrants are coming, in, depressing the wage so that it’s below the level that natives would want to work. I think that probably is part of the problem, but it’s not the entire problem. And there’s a number of other explanations out there. I will not try to adjudicate all of them, but it’s, I think, worth it to point out what some of those are. So on the left we often hear that manufacturing jobs have left the cities. We hear that unionization rates are declining. And on the right, it’s more about the welfare state, it’s more about social expectations for work having changed over time, all of which I think are perfectly plausible explanations. Now, the White House actually put out a report recently on this labor force participation problem, not talking about immigration very much of course, but they mentioned – I mean, they had this whole report, and it was a pretty good one. I mean, I recommend reading it. But it did come to a conclusion that I think it would not have come to had they considered the immigration angle. One of their conclusions was that it’s just a declining demand for low-skill labor – it’s just that there’s just not much demand anymore for manual labors and such, and so that’s why the wage is going down; that’s why, you know, there’s not many people working. I think that, had they thought a lot about immigration, they might not have come to that conclusion because we know from these slides that immigrants are finding plenty of work, even at the low-skill level. And they’re coming from very far away to get that work, so they must be hearing about it. Now, actually, ironically – or maybe I should say hypocritically – the White House has in the past talked about the shortage of low-skill workers. They talk about that in the context, of course, of immigration policy. So three years ago, when pushing for an amnesty and guest workers and so on, they told us about how low-skill laborers are hard to find, that there are these unfilled jobs – there are crops rotting in the fields, we can’t find anybody. But then, three years later, they tell us there’s a surplus of low-skill labor. So I think they don’t really have their stories straight, but I’m not sure that it really matters. Anyway, I’m not going to try to further adjudicate all those things. My point, really, with the paper is to say that as natives have been dropping out of the labor force, immigrants have been the backstop. They have been the crutch. And immigration has basically helped to devalue the problem in people’s minds, because as you bring in immigrants to replace people, those industries go on working as they have before for the most part, and you just don’t have people necessarily feeling like they need to care about the problem. Imagine the reaction if we did not have low-skill immigrants coming in, if there were not a large supply available to work. I would think that politicians and employers would be very, very interested, suddenly, in getting natives back to work and back into the mainstream of society. There are some tantalizing sort of microcosm examples of that happening. One of them actually was mentioned in George Borjas’ new book, which I recommend. It was a chicken processing plant in Georgia. This was during the second term of the Bush administration. And, long story short, basically, there was a raid on the plant and the plant lost 75 percent of its workers overnight, practically overnight. And so, what happened? They wanted to keep running the plant, right? So what happened was the employer there made a very, very strong, concerted effort to get natives to come work there. And it wasn’t just wages. I mean, they did raise wages, but they advertised heavily. They offered free transportation to the plant. They even offered free housing for the workers to come, you know, and live right next to the plant if they wanted to. And it worked, to some degree. I mean, a lot of natives did sign up. This was a predominantly black area of Georgia. And you know, I don’t want to pretend this is a completely happy story. I mean, so what happened was they were able to recruit a lot of natives, but there was still some friction. There was tension, because the natives complained a lot, still, about the working conditions and the wages. And whether you think those are legitimate complaints or not I think depends a lot on your perspective on things. But my point is this was something that was a good start, and maybe that could actually happen on a national level if you had a national-level immigration policy similar to what happened in Georgia. Now, incidentally, it’s not just employers that might have a reaction. It would be politicians, as well, reacting to what the employers are complaining about. There are a number of policies out there aimed at trying to get natives back to work that might work. I’m not saying they will, but they’re on the back burner, somewhat. I used to work at a conservative think tank. The name escapes me now, but I did work there for like three years or so. And I – and at the time we were really pushing work requirements for means-tested benefits. And so, obviously, that was done with AFDC, which became TANF in the mid-’90s, but you could do it for other things, like food stamps. If you’re an able-bodied man, you know, why should you not be required to work if you want to receive food stamps? So these are the kinds of policies that I think would suddenly get a very strong look if we had a system where we did not rely on immigration as a backstop or a crutch. I’m not saying it’s going to work; I’m saying it’s something that, you know, we should try, and we’re not trying at this point. I just want to wrap up by pointing to one of the common arguments in favor of low-skill immigration, which is that it will push natives upward – that it will – it will cause natives to get high-skill jobs because they’ll just have to because they’re facing more competition. And it is true, of course, that education levels for natives have been going up and there’s been a big push to get natives graduating from high school. But that doesn’t seem to have helped with the dropout rate from – I mean, the labor force dropout rate. And it doesn’t seem to have really improved skills very much, as you lower the standards for graduation and test scores are stagnant, but nevertheless people are still getting those degrees. The point is that we have a situation where there’s always going to be a certain portion of the population – a non-trivial portion – that are not going to be able to respond to immigration by moving up in skills. There are people who are just not academically oriented in a way that that’s going to work for them. And we always are going to have people like that who are left behind in our knowledge economy, in a high-tech economy. Our challenge is to find, as Charles might say, a valued place in society for that group of people. We are not doing a very good job right now. I don’t pretend to have all the answers, but I do know that one answer is – I’m sorry, that one answer cannot be to bring in more low-skill immigrants to compete with them and to further devalue their problem in the minds of most people. MR. CAMAROTA: Well, thank you, Jason. MS. WAX: Well, thank you for inviting me here to comment on this very interesting paper. I’m a great admirer of Jason’s, and of Charles Murray’s, and CIS, so I am very glad to be here. I fundamentally agree with Jason’s story, and in particular want to emphasize his point that the influx of less-educated foreign workers – mostly Hispanic, but others – has distracted us politically and otherwise from declining now-skill male workforce participation. And this has been well-documented by Jason, by people like Nick Eberstadt. And I also agree that this is not a demand problem. Now, this distraction enables journalists and other kibitzers to say all sorts of contradictory things, and I think that’s one of the downsides of it. So I do think that immigration – the immigration surge exerts – to quote Vernon Briggs, the late Cornell labor economist – a “narcotic effect” on low-wage employers and the rest of us. But I want to add to his account and supplement it by looking at a particular aspect of the story that I think is important. Not only does the availability of low-skill immigrants blunt the adverse labor effects of reduced native work effort, but it also masks, I think, a painful truth about the relatively poor and deteriorating quality and work ethic of our unskilled workforce. And of course, I’m lumping here; there’s obviously a range. I’m talking about the average. And this latter point leads to my partial cautious disagreement with Richwine on the displacement issue. I recognize it’s hard to prove displacement, for reasons good and bad. These categories of who’s looking for work are incredibly manipulable, and looking at the National Academies study, this is glaringly obvious. But I think there’s other evidence, albeit less quantitative, that suggest a kind of displacement. So what am I referring to here? Well, there are a handful of mainly ethnographic studies of employer attitudes towards entry-level workers from different ethnic and racial groups, including recent immigrants versus native workers of various kinds. These studies were almost all conducted in the 1990s—there’s one I’ve identified from 2011—and they begin with the fairly well-known piece by two social scientists, Joleen Kirschenman, Kathryn Neckerman, published by Christopher Jencks in his volume “The Urban Underclass” entitled “We’d Really Love to Hire Them, But...” and also includes some data from William Julius Wilson on Chicago employers published in “When Work Disappears.” And they consist largely of lengthy interviews of mid-level of small-businessmen and managers from different locations and industries. And, lucky for us, these studies have recently been collected by David Skrentny, an able political scientist, in chapter six of his book “After Civil Rights” – and I commend this chapter to you. But just to summarize, what are the results of these studies? For many jobs, especially low, hard-skill jobs, employers strongly and candidly prefer recent immigrant workers, Hispanic and Asian mainly, right, and others. They are not keen on white American workers. Those are sort of lesser beings. And they positively avoid black unskilled workers, especially those from the inner city of the ghetto. And they’re pretty unvarnished about it. Now, why these preferences? Employers from all groups hold these preferences – minority, immigrant, doesn’t matter, right? Well, they stereotype like crazy. They lump – they try to individuate, but of course time is short, knowledge is short, so they can’t always do that. In Skrentny’s account, less-educated immigrant Hispanic and Asian workers are seen as having better work ethic and far superior soft skills – which is what counts in this population, because the hard skills are minimal. They’re more tractable, diligent, punctual, agreeable, hardworking, reliable; less demanding, surly, oppositional, et cetera; willing to, quote, “work through pain and injury to do boring and repetitive tasks.” They’re helpful and loyal, they step up, and they volunteer to perform beyond the call of duty. And this is all in the chapter. Now, Skrentny sort of avoids opining on whether these preferences are justified. He’s very concerned about the lack of PC here. But it is clear from the studies and his exposition that these attitudes do influence hiring by employers, who go to great lengths to find the workers they favor and avoid the workers they disfavor. And I think the implication of these studies is something like a displacement story, although of course not quantitative and systematic, right? The more immigrant workers there are to fill the construction and service and farm and restaurant jobs, the fewer native workers are going to get those jobs, even if they want them – and that’s a big “if,” and more on that in a moment – and maybe there will be a kind of discouragement effect. And here is the displacement angle: maybe the native workers or the black workers know they’re not going to get the job, so forget it, right? Just don’t even go there. Now, this literature has shortcomings. It’s anecdotal. It’s not up to date. Most of it’s from the ’90s. Academics, interestingly, seem to have dropped this line of inquiry. Although ethnography is all the rage, they’ve stopped interviewing employers, maybe because they don’t like what they’re hearing, right? And it’s mainly focused on race and black unemployment, although there are comments interlarded there about the white sort of low-skilled trailer park types, right? So it would be interesting to see more studies. And of course, it only supports a partial displacement story. It’s about the demand side, but there’s also the supply side. Would workers step up and take these jobs? We have this mantra – this mindless mantra, “jobs Americans don’t do.” And I’ll say more about that, right? But I want to even add to this account. I think not only is there a problem in workforce shortcomings, but I think there is evidence of a deterioration in the past 15 or 20 years in the quality of the native workforce. Once again, not systemic, not complete, right; little bits and pieces here and there. First, as reported by David Autor, an economist at MIT, a prolific economist, and others, there is now growing evidence that changing family structure, the rise in single-parent families – which are almost the predominant form of family in the lower 50 percent of society – has harmed lower-income boys disproportionately, undermining their socialization to education, work, family life, and constructive social roles. And I think that has to play out in work readiness. Apart from that, there are other observations that I think also point to a declining worker quality. And once again, this is quite anecdotal, but if you read the newspapers, it’s amazing – it’s amazing what you’ll pick up if you pay attention. So, item: recently a report that Quest, a company that performs medical and drug tests for businesses, has seen a dramatic spike in positive drug tests for job applicants, right, and especially among whites, especially among native workers, right? And of course, this is supported by stories of rising problems with drug use and addiction. And then, of course, there is conduct problems – that is, lawbreaking – and that’s a big problem in the black population. And physical fitness also plays a role, and this ties into the rising disability rolls, right? Obesity, poor health, lack of exercise, and all of that. At a conference, an industrial organizational expert told me that one-third of high-school graduates cannot even qualify to enter the military, right, because not only can they not pass the AFQT, but they have criminal records, drug problems, obesity, poor health – they can’t pass the physical fitness test, right? Now, these observations and the employer interview literature itself – which, as I said, is sort of viewed now as a kind of academic hotcake – pushes hard against the standard progressive narrative. And I think the standard progressive narrative really is – looms large here as a sort of major factor in this whole debate, right: the native joblessness problem has nothing to do with the qualities or readiness of workers, it’s due to broader forces, changing labor markets, disappearance of good jobs, globalization, corporate greed, these structural factors, right? And Jason detailed some of that: immigrants aren’t to blame, they take jobs Americans don’t want – not further examined; workers aren’t to blame, they want to step up, they have a great work ethic; the government isn’t to blame, the safety net doesn’t disincentivize work, family breakdown and men’s declining responsibilities are irrelevant. So, Jason, I thank you for your paper. It’s very important. But I would add the further points that employers prefer immigrants, the quality of the native workforce leaves much to be desired, and of course ideologies and self-interest – you know, from the business class, who wants cheap labor, to the left-wing elites, who want pro-big government minorities and conspire to maintain this narrative, right, about the structural source of the problems of our native workforce – all of this conspires to keep us from having to confront these realities. And I think it also bears on whether the shock-therapy solution, if we could wave our magic wand and close the spigot of immigrant low-skilled workers, whether that shock-therapy solution would work. Given the zeitgeist, I’m not optimistic. But I know that it’s very important that we think about these issues, so I thank you. MR. RICHWINE: Oh, he went and ruined that. MR. MURRAY: Jason was right to say that I have not really published much of anything on immigration, and so I suppose that I’d better come clean and say what my attitude has been. Actually, in response to a request by John Derbyshire way back in the – I guess about 10 years ago, when he was at National Review, I did post a blog. So I am on the record. And what I was saying was that, even though I’m a libertarian, I think one of the functions of the nation-state is to have borders and enforce those borders. And so I would be in favor of enforcing the borders, and if that took a wall, so be it. And I also said good things about high-skill immigration and good things about providing amnesty, but having secured the wall, so subsequently there would be only legal immigration. But I didn’t say anything about changing the immigration laws regarding low-skill immigration, and I am going to say something about them today. First, I don’t think I’ve heard an empirical assertion from either of the two speakers with which I disagree. I thought the paper that Jason had was meticulously presented in the paper, and I don’t have any problems with the data or the analysis. I’m also familiar with the literature that Amy Wax was quoting, and she was quoting it accurately. And I can add to that my own experience when I was doing a book called “By The People,” which was inspired initially by an employer of immigrant labor who brought them in legally, and listening to him talk about the – exactly the kinds of problems that Professor Wax talked about, about he’d be happy to hire white Americans or black Americans or any native-born Americans; he cannot get them to take the work that he has to offer, even though he pays good wages – $10, $12, $14 an hour, plus benefits. So all of these things are true. And I have had to undergo a great deal of rethinking this year about what I make of all this because I think I probably would have come down pretty close to what Amy Wax just said a year ago. And the catalyst in the change in my thinking has, in fact, been Donald Trump – (laughter) – and I should say that the reaction he has aroused. And I should say categorically, just so you know, whether it makes you mad or makes you happy, I would not under any circumstances vote for Donald Trump for president. I think he is utterly unfit for the office. I’m not going to argue that point. I’m just going to say everything I say after this, that’s the backdrop against which – against which I’m saying it. The thing that has gotten to me over the course of this year and this intense debate has been the idea – a very simple idea – that the citizens of a nation owe something to each other that is over and above our general obligations to our fellow human beings; that there is a sense in which we should take care of our own, our own in this case meaning Americans – native Americans in the – in the real sense of that term. Before, I rejected that pretty much without thinking. I was saying, look, you know, people complain about shipping jobs overseas to sweatshops in Vietnam. Well, I’ve lived for six years in Thailand, and I’ll tell you for a fact the jobs in the factories over there, first, they are not sweatshop conditions by any real sense of that term; second thing is, the working conditions and the pay is way better than they’d get if there wasn’t Nike or foreign corporations doing it; and, third, there’s a lot better chance of getting advancement and promotion in American or multinational-owned businesses than there are in the locally owned Third World country, because the locally owned ones are family businesses and you don’t get anywhere unless you’re a member of the family. So in all those ways, I was very positive about globalization. And there is reason to be positive because, the statistics about a billion people having been lifted out of extreme poverty over the last 20, 30 years, those statistics are true. And yet, I read The Economist’s analysis of the effects of immigration, and I read the ways in which actually more immigrants mean higher economic growth: it’s not that the immigrants are taking away jobs from Americans; it’s the kind of phenomena that Amy was referring to, where you got to get somebody to do the jobs and Americans won’t do them. I read about the ways in which people who think they have been pushed out of jobs haven’t really been pushed out of jobs. And there is an element of truth in all of those things, and yet, I want to try Amy’s grand experiment, I have finally decided. I want to shut down low-skill immigration for a while. And I want to shut it down – and I say for a while because it may not work. It may not work. The notion is this: we will have no good way of knowing how employers will respond until the spigot is cut off. We will have no really good way of knowing the extent to which you will get feedback loops that will un-demoralize a lot of the people who are out of the labor force. Now, there’s nothing magical about this. It’s not the case that if on January 1st there was no more low-skill immigration that all at once you get all of these white guys or black guys who are currently out of the labor force and they say, OK, we’re going back. You have a real problem with lack of job readiness. You have terrible problems with a lack of job experience. You have terrible problems with drug use. All of the things Amy said, they’re real – absolutely real. They won’t happen instantly, but you will set up feedback loops, such as the guy’s girlfriend saying to him, you know, actually they’re paying 13 bucks an hour for this job down there and, no – (laughs) – there are no more illegal immigrants working; maybe you ought to think about helping to pay the rent. And going – and you think – you think about millions of those kinds of feedback loops, and you think about them over a period of months. And then you think about, yes, will there be terrible costs associated with a variety of businesses that will simply go under. So it may very well be there’s going to be no more American-grown strawberries because you just can’t get labor to pick strawberries at any wage that would be affordable, because if you pay the wage that it takes to get people to do that with native Americans, nobody’s going to buy your strawberries. And that – will that happen? And will that mean human tragedies for people whose businesses will go under, even though they’re playing by the rules and paying good wages and being good employers? Yes. That is – that’s sad. It’s terrible. So you will have downsides for doing it, but we will also be setting up an environment in which we start to try to address a problem which threatens the very nature of this country as the kind of country we have always wanted ourselves to be. It has been the signal characteristic of American exceptionalism – and one of the things – and American exceptionalism, for those of you who are not on the same page, this is not a phrase that comes from Americans bragging about how wonderful America is. It’s a phrase that comes from Europeans who visited us in the 19th century and said there’s no place like this. It’s weird, but here’s the way there’s no place like it. And one of the ways in which there was no place like it was the egalitarianism of America. I don’t mean egalitarianism in the modern social democratic sense; egalitarian in the sense of Americans all wanted to see themselves as part of the same class. And so working-class people who were clearly lower-class working-class people refused to see themselves as such. And people who were wealthy – I’m not talking about the New York 400, but you go to the people who are rich in Cleveland and Cincinnati and Kansas City and St. Louis, and they were talking about they were just ordinary people, even though they had a lot of money. And by the way, oftentimes they had grown up in very modest circumstances and they could say with good reason that they were ordinary people. The United States is quickly growing into a class culture. This is what a book I wrote called “Coming Apart” is all about. And there is a sense in which – Amy did not say this, and I don’t want to put this into her mouth, but there is a sense in which you look out at a fairly large chunk of American lower-class society – and it is not a racial thing, as “Coming Apart” documented – (laughs) – it’s a white thing, as “Hillbilly Elegy,” the bestselling book is documenting. It’s a white thing, too. But you have a large chunk of people who are dropped out of participation in American society, and there is too much of a readiness on the part of us who are quite fortunate to say, well, that’s tough. OK, we won’t let them starve in the streets. We’ll have enough welfare for them and all that sort of thing, and we’ll continue to say politely politically correct nice things about them, about we need a more vibrant job market and we need yadda yadda. But we aren’t really going to take care of the problem. And meanwhile, those of us who are at the top of the heap get some really terrific cheap nannies and some really terrific cheap gardeners. We need to reconstruct an American society in which people are proud of being part of one brotherhood/sisterhood in the United States, of a kind that was never perfect in this country, but by God did we get a lot closer to it than any other society. Because, as far as I’m concerned, it is not enough to live in a wealthy Western advanced society. I want to live in America, and I want to live in America as I think it ought to be thought of. MR. CAMAROTA: Wow. That’s a lot to think about. OK. Well, I’d like to exercise the chair’s prerogative and ask my first question. And I want to push back a little bit, as being maybe someone who’s not very conservative in some ways, and try to make the liberal argument a little stronger. If you look at wages – something you didn’t mention, Jason – for people with less than a high-school education, men, you can cut that data several different ways, but in the last 35 years wages are about 22 percent lower in real inflation-adjusted terms. At least that’s the best number I’ve seen. If you compare them to college graduates, then you’re looking at a relative decline of wages much higher than that, maybe a 35, 40 percent decline in real wages. When we look at specific occupations, one that’s been studied a lot is meat and poultry processing, people who work on – not a pleasant term – the kill floor, where they do some very unpleasant things in very difficult circumstances. Those jobs, as far as we can tell, pay about 45 percent less today than they did in 1980. Do you think that those kinds of declines in wages play a significant role? Look, if you’re coming from Oaxaca or Guatemala, $13 might still might be good, or $12, to cut up dead animals in a very cold environment. But we haven’t paid that kind of – well, we didn’t in the ’70s and even into the – ’60s, ’70s, and into the ’80s, we didn’t pay that; we paid a lot more, if you adjusted for inflation. Don’t you think that plays some role in the decline of work? I’m not saying that I don’t think issues – some of the issues you’ve talked about, but don’t liberals have a reasonable point? I don’t think you have to be that liberal to say, well, gosh, if I were to say to you I can’t find workers for my business, and oh yeah, I pay half what I used to but you know, I can’t find anybody, don’t you think somebody might say, well, don’t you think that’s part of the explanation? What do you think? MR. CAMAROTA: And that’s open to anybody. MS. WAX: I’m happy to comment. MR. RICHWINE: I’ll just start quickly. I mean, I did not say that I disagree, necessarily. I was deliberately agnostic about a lot of these points, because I – this is on, right? – I was deliberately agnostic because I don’t necessarily want to, you know, make a stronger empirical claim than I have to in terms of, you know, discussing the need for restricting low-skill immigration. I do think, you know, that, with wages going up, I think you certainly could see an improvement. And I would say, too, I mean, it’s interesting that, you know, Charles, when he was talking, seemed conflicted, in a sense. You can kind of tell that the libertarian in him does not want to be saying what he is saying, but nevertheless it feels like that’s what is needed right now. And I actually feel similar in that, you know, when I read the stories of the natives who were complaining about the job conditions in that poultry processing plant, my own reaction was, gee, they should just get to work, you know, and stop complaining. And that’s just me. I mean, I understand other people have a different perspective. So I am also kind of going against something of my own political ideology when I say, yeah, I do think the wage should go up if that’s what’s needed. MS. WAX: Yeah, I think, you know, we’re conflating the normative with the positive here. I mean, is confounding your expectation to make more money, your reservation wage, you know, actually cause people to drop out? Well, I think that’s probably it does. But on the other hand, is idleness better? And this goes back to our cultural attitudes. It is unfortunate that these jobs pay less. It is unfortunate that the economy changes and that, you know, it’s a moving target. It really is. But implicitly, we’re expecting immigrants to do this work, and they put together – they cobble together multiple incomes and they manage to have a cohesive life, and they look for improvement in the next generation. So, you know, we sort of have a double standard for immigrants and for natives. So I think that, you know, I would say I’m sorry, I know these jobs are not terrible attractive, they don’t pay very well, but are we really committed, as Charles said, to keeping this whole raft of people idle with all of the implications and fallout from that, you know, while the elites go on their merry way? I mean, this is really socially corrosive in all sorts of ways. And really, I think the elites at this point have just abandoned any confidence in the importance of work. They’ve abandoned tough love. They really feel like they don’t have the standing to stay to people: Work is part of a dignified life. Work is what men do. And at the end of the day, you would be better off doing that than being on some form of the dole. MR. MURRAY: Well, I think that one of the major problems we face is that we live in a world, and have lived in a world for the last century, where one particular set of human skills have become more and more and more valuable in the marketplace, and that one peculiar set of skills goes under the label of IQ, cognitive ability – raw cognitive ability, ordinarily construed, measured with wonderful accuracy by IQ tests, as I have demonstrated at great length and in other contexts. Nobody deserves this IQ. You don’t deserve a low one and you don’t deserve a high one. Believe me, a lot of you in the room have high IQs. It’s not because you studied hard in school. You were really, really lucky. And those who have low IQs were really, really unlucky. So I’m perfectly happy to give people credit for hard work. When Barack Obama said, “You didn’t build that,” I just got as angry as a whole lot of my friends got. But on this one thing, I think that as you’re thinking about society, you start out by saying, gee, we do have this inequality in incomes, and it has been getting worse. And the people at the top have been really shooting up and others haven’t. And a great deal of that is because of living in a particular time when a particular skillset is the cat’s pajamas in terms of making income. Under those circumstances, I am still in favor of the free market for wages. Free market for – I’m in favor of all kinds of aspects of the free market. Do I feel that you are living in a market in which market forces are really at work if you have an unending supply of people who are willing to work for low wages? I don’t think so. And so by cutting off – I’m going to be really curious to see what happens if you cut off new low-skill labor, because whereas it may be hard for the strawberry farmer under any circumstances to pay a wage high enough to get people to pick strawberries and continue a strawberry farm, if you are talking about the chicken processing, well, you’ve got – a couple of things are going to happen. First place, Americans are going to continue to eat vast quantities of chicken, and we can’t import it all. So we’re going to have to continue to have chicken processing plants here. And, yes, one of the incentives at that point will be to build machines that can do all of the jobs in processing chickens. And that incentive will be there, and that may very well be the solution to it from the point of view of those who process chickens. It also may be it turns out to get people to work in that kind of environment and work hard and do a good job, you got to pay 20 bucks an hour. And that is going to mean a price of chicken that is somewhat higher than we pay now. You know what? I’m willing to pay a higher price for chicken if it turns out that the going market price, if you cut off low skill immigrants, is 20 bucks an hour for people who work in chicken farms. I can live with that. I want to see – I want to see a market for wages. I want to see employers free to substitute machines for workers. I am not prescribing a top-down economy. Believe me, Jason, I will defend my libertarian credentials, except that libertarian principles only work when the playing field is pretty damn fair. And I think the low-skill immigration – this is where I really, really change – I think the low-skill immigration deforms a great many of the processes that are required to make the free enterprise, free market system that I like work. MS. WAX: Can I just say one more thing? MS. WAX: I don’t want to take any more time. I think the measure of a great society – and I do believe this – is the place it makes for the most humble among us. And I absolutely agree with Jason. There will always be low-skilled people. They will always be there, just like the poor will always be there. And by bringing in sort of fresh replacement troops – I am completely in favor of shutting down low-skilled immigration – the elites really are operating in bad faith. They are – they are essentially saying: We don’t care about these people and we are not willing to give them a fair chance, perhaps at the cost of paying higher prices. There are going to be some changes that will have to be made in society. But, you know, we love the cheap labor. It’s great for us. But it is not great for our society in the long term. MR. CAMAROTA: Well, thank you. I do want to inject one thing, since this is the kind of thing I study. Actually, the issue of how much it would affect consumer prices has kind of been studied. In agriculture, where immigrant labor makes up the largest fraction, the people who pick the fresh fruit and produce, where labor makes up the biggest – some produce is just all mechanized now, but harvesting of certain kinds of things, like head lettuce. Well, it turns out that only 6 percent of the consumer price at the supermarket is determined by the guy who picked it. Everything else is herbicides, pesticides, the cost of land, transportation, packaging, what have you. So in a world in which wages had to go up 50 percent, the implied increase in cost to consumers would be half of six, 3 percent. And that would be a one-time increase, assuming none of it – all of it got passed through to consumers. In meat and poultry pricing, the percentage is assumed to be a little higher, but still only around 7 or 8 percent. So you could pay workers a third more or 40 percent more. Remember, here’s another statistic if you care, the bottom 10 percent of the U.S. labor market only accounts for about 3 percent of the economy. Even the bottom 20 percent is only like 6 percent or 7 percent. Those workers at the bottom really don’t make very much. And so even if wages rose a lot at the bottom, and it couldn’t spike inflation very much because they don’t make anything to begin with. So something to think about, anyway. MS. : Let me first say, we have copies of the study outside the room – if you want a copy of Jason’s study. Also, if you haven’t signed in, we’d appreciate it if you did. And I’m going to start back here. MS. : Can you please identify yourself first? Q: Oh, hi. Neal Munro. I have a few minor points on the question of immigrant labor. Any immigrant labor is enormously subsidized by the federal government to a colossal extent because any person coming into the country receives a massive, massive, massive subsidy by getting a job here. It’s called citizenship, and the value of citizenship. So in effect, any job for any immigration is a colossal giveaway by the federal government. On the question of status, you mentioned the girlfriend, which is weirdly enough the example I use. We don’t measure the status changes caused by immigration in lower-end workplaces or in higher-end workplaces. Do you know of any researchers who try and keep track of what the price of working with illegals is or the price of working with immigrants does to career choices and suchlike? MR. CAMAROTA: I’m not sure I understand the question. You’re asking, do people try to look at the presence of immigrants and – you’re not asking whether the presence of immigrants affects labor force participation? Q: Let me try it again. MR. CAMAROTA: No, you’re right. It’s very difficult, right? If everybody who works at that shop speaks with an accent and you don’t, is that a place that, you know, would be very welcoming to you – those kinds of things. Yeah, yeah. MS. WAX: Just yesterday there was a story on precisely this point of rising wages among low-skilled, and said one – one person said, I had to work with all these people speaking Spanish. It was really hard to do that. MR. CAMAROTA: Right. So, no, there’s anecdotal stuff, right? We all see signs at a restaurant where the sign for the job of the cook in the back is only in Spanish, right? We’ve seen that. Q: But there’s no particular research on it. MR. CAMAROTA: Not on that particular question, how immigration affects social status. But I could be wrong, actually. Let me think about that, because something does suggest that there’s been – but there’s not much. So, anyway. Q: Hi. (Coughs.) Excuse me. I’m Penny Starr with CNS News. Mr. Murray, I was sort of taken aback when you started out by mentioning Trump, and then with your remarks I realized why you said you’re not voting for Trump, because you brought up the issue that seems to resonate with the Americans who are supporting Trump, and maybe even the group of people you’re talking about, who are idle, who are wanting the job, are the exact people who are supporting him. Q: I don’t need a microphone. MR. : You do, though, for the video clip. Q: I’m clearer without a microphone. MR. : For the video. Q: Oh, the audio. OK, all right. I’m blasting my own ears right now. There’s an old moral principle that states that if you desire the ends you desire the means. And so this is – I’m tying onto what you said a little, though I’m not addressing it, because I was going to say it anyway. And so I’m addressing Charles Murray. If you desire the grand experiment, as you put it, regarding Amy Wax and a moratorium on low-skilled immigration, you can’t get it if Hillary Clinton is the president. And she – it’s either or: Trump or Hillary. So if you desire the ends of this grand experiment then you desire the means of Donald Trump. So I don’t see how you can – how you can square that circle. MR. MURRAY: It’s real simple. If Donald Trump were to adopt every jot and tittle of the thinking of Friedrich Hayek and Milton Friedman, I would not vote for him. It is possible to have a temperament and a character which makes you unfit to hold the office of president of the United States. I’m not going to argue with you about whether I am right in thinking that, but that’s what I think. Q: This question is directed toward Amy Wax. First of all, I’ve read some of your material. I admire your work, as all these people here. That’s why I’m here today. I wanted to ask if part of the problem with the lack of research – I’m a former graduate student at a couple different universities. Did a bunch of research for professors which they happily took credit for with a short summary on top. That’s why I didn’t bother to stay to get a Ph.D., then I would have been a part of the problem. The point I want to raise with you is whether you think or not think – and this is just your opinion, there’d be no study to show this – that part of this – part of the intellectual disengagement from the reality of the suffering of the lower class is because the professors have become part of the elite, either by emotional, intellectual attachment, or because they’re just this – a lot of the work I did 40 years ago tied to a lot of this stuff. It’s not done anymore, for some reason that I don’t understand. So perhaps some of it was funded by great society. But why is there so great a disinterest? I’ve been to several academic conferences in criminology and they’re just studying the stupidest stuff, and people are getting a lot of money for it. Now, some of this is recent, with the Obama administration, but some of this has been going on for a long time. So just your comments about academics, professors, and are they now part of the problem? Because a lot of them do have very fine gardeners and very fine cooks and housekeepers. And they are all illegal, so. MS. WAX: Well, they’re not all illegal, but they’re not paying them very much. I mean, I absolutely think that academia is, you know, now – maybe I shouldn’t even use this word – it’s almost a kind of cesspool. I mean, what has happened to academia is shocking. It is shocking. And, you know, Charles has described some of the problem. There has been a kind of acceleration of this entrenchment in what I call the narrative, this whole worldview which cannot be penetrated. Now, these people think that they have the interest of the working class at heart and that they are their great champions. So, you know, the amount of self-delusion is tremendous. But there’s also been this divergence. It’s mainly been education driven. So all the people in academia are very highly educated. They’re not necessarily rich, but they make enough money to live with like-people and like-minded people with the same cultural orientation. And it is locked in. I will just tell a very quick anecdote. I was in the People’s Republic of Stockbridge (sp) this summer visiting a friend of mine in the most upscale, lily-while neighborhood you could possibly imagine. We were at brunch. The host made the mistake of asking me what I thought would happen to Trumpism after Trump was defeated. And for some reason, I got off on how, you know, I thought that we should have more respect for the achievements of European culture, of Western civilization. It’s really responsible for all of the advances of modernity, and we should be more concerned about preserving, protecting, and defending it. You know, I was – and I just didn’t see that concern among my colleagues. Well, there was a guest there, a very well-educated woman, very fancy. And she said, I cannot listen to – she put her hands over her ears – she said, I can’t hear this. I can’t listen to this. I just can’t – and she stormed out of the room. MS. WAX: It was astonishing. Q: Well, thank you. Craig Keller from Washington state. I just – thank you for your research, Dr. Richwine. And what I’m thinking about throughout this is, as an economics major, but we can’t quite analyze it strictly through the statistics, which you’ve done a terrific job with. I’d like to share that in 2011, when there was a lot of gnashing of teeth out in Washington state about how they were having to hire inmates to go pick the apples, I decided to conduct an experiment. I went for two weeks and conducted – and picked apple. Excellent work. Healthy work. It’s just wonderful. It’s hard. But what I wanted to say is there have been a lot of barriers to entry that are frustrating clearing mechanisms that we need. For example, housing requirements that have inhibited the growers from putting in housing that formerly supported retirees to come pick apples, and for that intra-American migrant labor force that used to happen from Oklahoma to Washington state, or north-south. It’s now become an international migration. Also, even the state-run employment security office, the artificial requirement that you have to hire somebody within 50 miles of the location. So even my own state wouldn’t help me. I had to procure that employment directly with the grower, because the illegal who lived within 50 miles of the orchard had a better chance of the state helping them find the employment than me, 200 miles away in Seattle. And then lastly, to refer to Dr. Wax’s comment, there is a true distain for hiring white workers, or maybe even those black workers from Seattle, or maybe the black workers who were rioting in Charlotte, because they do prefer a certain ethnic group now. And that has to do also with whether it’s the Hispanic that runs the work source, the state employment office in that little location, or just the local kind of job guy that can round up his buddies to work. So there’s some barriers here that suggests that this problem is even worse than the statistics that you have identified. And so thank you for your work. MR. RICHWINE: Just to follow-up on that, you mention the mobility. I think it really is an extremely important issue that, you know, we need sometimes to encourage people who are natives, you know, to – they can actually move. I think Kevin Williamson actually was one of the people that made this point. That’s right, you can move to where the jobs are, if that’s where they are. And it is unfortunate, you know, to sort of follow up on what Dr. Wax has been saying, that people can come from Honduras and Guatemala to find these jobs in the United States, but they can’t come from Kentucky. So absolutely, mobility is a big issue. And I – you know, as Dr. Wax said, I don’t really have any problem with the fact that there really is a real difference in the effort and the skill level sometimes of natives compared to immigrants. I hear the same stories. I mean, I’ve talked to contractors myself. It can be kind of revealing, because oftentimes contractors are not particularly political, especially the smaller-time ones. They often don’t even know what is politically incorrect to say. So you can really get a – like, have a fun conversation with them. And it’s the same story. I mean, it’s the same story that Dr. Wax said, that, you know, there’s one guy in particular who said, when guys around here started hiring illegal immigrants, you know, I was against it. I thought it was completely wrong – this is what the contractor said. But then again, you know, I realized something, which is that those workers were just a lot better, from his perspective. And I said the normal things. I said, well, are you sure you’re paying the natives enough, and so on. And, you know, maybe he’s not. Maybe he’s not. But you know, when you hear these stories over and over, there’s definitely something to them. And that’s why I think, as Charles said, you know, the grand experiment can try and get at all of those things. You know, let’s get at the root causes of this stuff, and hopefully get people back into the mainstream in a way they haven’t been in a while. MS. WAX: Can I just say one thing? People say, well, if the Spanish are such great workers, and the recent off-the-boat immigrants are, why don’t we want them? And I think the answer is it’s very short-term thinking. If you look at the second generation or third generation of Hispanics, they become more like Americans and not in positive ways. And they also have very low educational completement. Their out of wedlock birthrate is skyrocketing. I mean, they are falling into the underclass. That is, you know, a sort of long-term perspective, and why – you know, and there’s a whole cultural story here that we haven’t even, you know, talked about. You know, they are not – they don’t stay the way they are once they come to America. MR. CAMAROTA: She’s got the microphone. Q: Would the panelists comment on the – I think there’s a differential in the cost of living from an American citizen – native or otherwise – and illegal alien labor, because an American citizen, their standard is having a following – living in a home, have a certain basic level of living standard that they expect is what is normal. And illegal alien workers might work, you know, eight, 15 to a two-bedroom home. And there’s – they will put up – they don’t have the similar costs that American citizens do so they can work for less and make more profit. And I think perhaps, would you agree or disagree, that this is also a reason where an American citizen will look at, well, this job pays this amount. Can I have a normal life earning, you know, $10, $8, $12 an hour? And I think that might be a reason to say, does it make more sense for them to not take that job and look for a job that maybe pays $14, $16, $18 an hour, rather than immediately working at an $8 an hour job or a $10 an hour, but knowing that they will not be able to pay their bills and feed their families if they have one? MR. RICHWINE: I mean, immigrants certainly have a lower reservation wage than natives. I mean, it’s just very clear, I mean, for all the reasons you’ve already mentioned. And I think it does get to the point about what kind of society do we want to have? And this is which Charles said about what do we owe our fellow citizens? And I think at minimum it must be having a minimally first-world standard of living. And if you have an open-border situation, you know, it’s not often mentioned but I think it’s certainly quite true that, you know, the wage will fall to work levels. And I’m not sure that that’s what we want as a society. MR. MURRAY: Let it be noted that Adam Smith himself referred to the definition of poverty relative to what is considered a decent standard within the society. MS. WAX: And, you know, I think everything you say is an argument to limit low-wage immigration, right? Once again, not making $14 an hour, $12 an hour, is idleness better? It really, you know, has terribly corrosive effects in the short term and in the long term. But there’s another piece to it, which is, you know, what the expectations are and what expectations are reasonable. These are very culturally sensitive. And I think that there’s – you know, the elites encourage, I think, outsized and somewhat unrealistic expectations from very unskilled people, sometimes just because they’re of lesser ability and not bookish, as John Derbyshire would say. But sometimes, you know, really falling into idleness because the society as a whole lets them off the hook and gives them the message that this is OK. So there’s a delicate balance here that we have to strike, you know, to give a fairly decent life to these people, but also be economically realistic. You know, it’s not easy to get the sweet spot, I think. Q: How you guys doing? It’s really a pleasure to be here. I’m actually a public policy intern at NASA, and love having these discussions. But I just had a few questions for each of you. A lot of the times when these conversations are had with some of my classmates and I, or sometimes my professors, some of the things that come to my mind are what is American, you know? That identity – like, how did we get here? And it makes me ask, is anti-immigration American, because essentially we’re all immigrants, in some sense. And to your question, when you were saying a measure of a society is how the society treats its lesser citizens, the question I would add to that is American poverty the same as global poverty? If you were to look at America in a vacuum, and what is considered the class system, is that the same as what poverty is globally? And when has isolationism ever worked in world history? So those if you – sorry I had a lot of questions. MS. WAX: Well, it worked for decades. I mean, to use these labels – isolationism, anti-immigration – I don’t think it’s helpful at all. You know, there was a long period in the 20th century where immigration was at a minimum. You know, we may be a nation of immigrants, but we are a sovereign nation. And I actually think America first is a healthy principle. We cannot rescue the world. We, you know, don’t have the same responsibility – as Charles says – to the – you know, the global poor as we do to our own. And I think that is a healthy principle. I think to abandon that principle is the road to perdition, right? And to road to extinction, really, as a nation. So I just question your premises. I think immigration has to be adjusted in a pragmatic way in response to the conditions that prevail. And I think right now the conditions are such that low-wage immigration is overall harmful to our nation. MR. CAMAROTA: I guess one thing I would say is that, as you probably know, there was World War I and then restricted legislation in the ’20s, and the foreign-born fraction of the U.S. population declined dramatically. So in the ’40s, ’50s, ’60s through the ’70s. By 1970, less than 5 percent of the U.S. population was foreign born. Had been almost 15 percent earlier in the century. You could argue that that is the period of time in which we created a middle-class society. America of 1914 was very different than America of 1970 in terms of the distribution of income, the home ownership rate, the distribution of wealth. It had become much more egalitarian in the context of low immigration. Since immigration has picked up, since the 1970s and onto the ’80s, ’90s, and now, we’ve seen a return to levels of inequality much more associated with the earlier period of high immigration. There’s certainly evidence immigration plays a role in that. But other factors have clearly contributed as well. But it is certainly true that low immigration seems to have coincided with a period in American history with the creation of a large middle class. But it does get to – you’re certainly right, to be poor in a foreign country is worse than being poor in the United States in general, by all kinds of measures. And then this raises the question of how many people to let in, right? You have the – always that famous conversation between Deng Xiaoping and Jimmy Carter when he said: Look, you’re not letting your people go. You know, you’re not letting your people go. And Deng Xiaoping said, how many would you like? Would you like 20 million, 30 million, 40 million? Just let me know. (Laughter.) And this gets to an important point. I think most people – though not all – some of Charles’ libertarian allies, say, at the CATO Institute, would say there should be no limit. And if it’s a billion people who want to come over a decade, that’s fine. But most people think we should limit it for a whole variety of reasons that seem like common sense. And if you’re going to limit it, then you’re going to have to enforce it because there’s always – the tendency is for many more people who want to come than above whatever limit we set. And we set it because we think it’s in our interest. You don’t want to go any longer? It’s – one more question? All right. Who’s that lucky person? Hasn’t asked a question yet, I think. Q: Question for Dr. Murray. You’ve said that on current demographic and electoral trends that the possibility of limited government, the odds are approaching zero. Is that also true of this grand experiment? And if so, if we arrive at your favored electoral outcome this season, is this all just a moot discussion? MR. MURRAY: My credentials do not include a very good track record on practical political prognostication. I am on record in 1992 telling the Middletown Maryland Women’s Republican Club there was no way Bill Clinton could possibly be elected president of the United States. And my predictions haven’t gotten much better since then. However, I think probably restrictions on low-skill immigration is an idea whose time has come. And I don’t put a lot of faith in Hillary Clinton’s fidelity to whatever she’s enunciating about her attitude toward immigration. The fact that Donald Trump has gotten the response he has cannot be lost upon Democratic politicians who want to have – win governorships and senatorships and House of Representatives, and things like that. There’s just simply too obvious that there’s out there a kind of sea change in the mood created by Donald Trump. And so I think actually probably there will be restrictions, if Hillary Clinton wins. Will they be large or small? Will there be better enforcement at the border? I suspect so, but I – again, I’m not the right guy to ask. MR. CAMAROTA: Well, one last question. Go ahead, please. Q: Yeah. So I had a last question. So Bob Putnam at Harvard has done good work on ethnic diversity. And Bill Easterly at NYU has done good work on ethnolinguistic fractionalization and its effect on social trust and social capital and rule of law, and sort of all sorts of other institutions that affect the quality of government and quality of life in a country. And I wonder, do you think that there is a place in immigration policy for thinking about the effect of diversity on American institutions? MR. MURRAY: If you’re asking do I think that it’s in the realm of possibility that we go back to the 1920s, where we let in immigrants relative to the existing proportion of ethnic groupings or something like that, no, I don’t think that’s in the cards. I think the question you have just raised is absolutely central to all sort s of problems. For those of you who don’t know, Bob Putnam first revealed what other people had found, but Bob Putnam made it well known, that ethnic diversity is associated with really devastating effects on social trust, which also has devastating effects on social capital. And it’s not just that the people in an ethnically diverse community don’t trust each other, social trust within each ethnic group goes down. And this seems to be true across lots of different mixes of ethnic groups. And this is not a social science finding that has been taken onboard by the mainstream media or by the rest of it. I know, it’s – you’ll be glad to know some of us are going to be writing about this – me, for example. But I doubt that this will get into the debate about immigration, and the reason being – let’s say that Hillary Clinton is elected, but suppose she does say that she knows which way the wind is blowing and she does want to have some restrictions on immigration. She will be absolutely obsessed with framing these in a way which protect her from being called racist, protect her from all the things that would be raised if she makes any mention whatsoever of the social trust issue. MR. CAMAROTA: Well, listen, I’m going to cut it off there. But I want to thank you all for coming, and I especially want to thank your panelists for a really interesting discussion. Did you want to say one more thing, Jason? MR. RICHWINE: Just before we go, I wanted to thank the CIS staff for putting this together. It was actually pretty fun seeing everybody come together. It looks like a simple thing to do, but it’s really not, to put a panel like this together. So thank you very much to the Center for Immigration Studies.